What does "schema-first" mean in this article? The term schema-first is quite ambiguous and in general conveys a very positive idea: Making schema design a priority in the development process. Thinking about the schema (and therefore the API) before implementing it typically results in better API design. If schema design falls short, there's a risk of ending up with an API that's an outcome of how the backend is implemented, ignoring the primitives of the business domain and needs of API consumers. 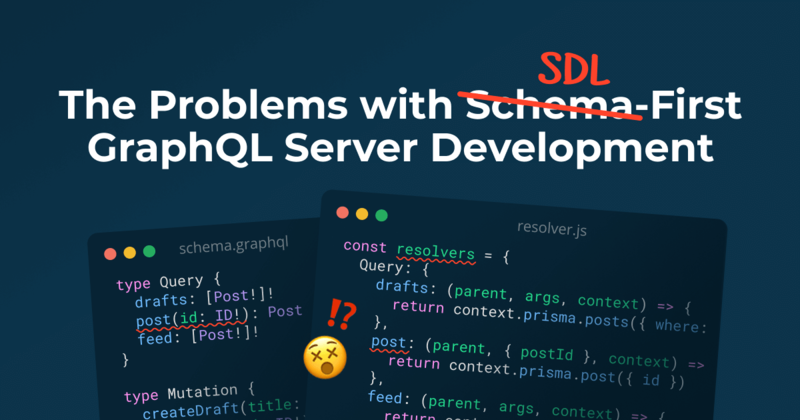 In this article, we’re going to discuss the drawbacks of a development process where the GraphQL schema is first defined manually in SDL, with the resolvers implemented afterwards. In this methodology, the SDL is the source of truth for the API. 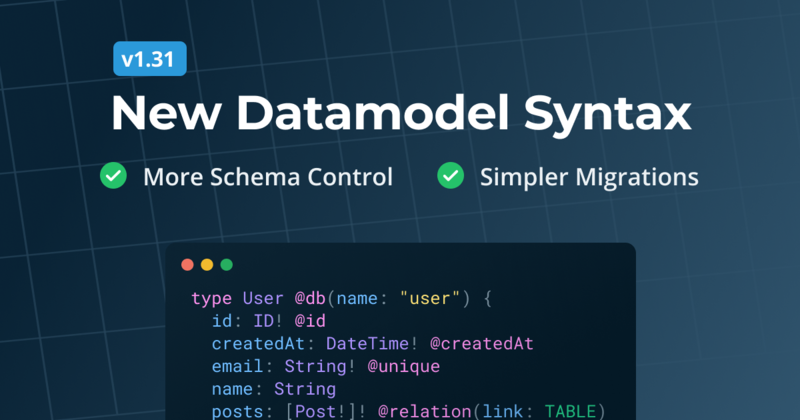 To clarify the distinction between schema-first design and this specific implementation approach, we'll refer to it as SDL-first from here on. In contrast, code-first (also sometimes called resolver-first) is a process where the GraphQL schema is implemented programmatically and the SDL version of the schema is a generated artifact of that. With code-first, you can still pay a lot of attention to upfront schema design! Learn more about building GraphQL schemas with graphql-js in this article. To ease development and increase the visibility into the actual API definition, Apollo started building the graphql-tools library in March 2016 (here's the first commit). These code snippets are 100% equivalent to the code above that uses graphql-js, except they're a lot more readable and easier to understand. While SDL-first has many advantages, the last two years have shown that it's challenging to scale it to larger projects. There are a number of problems that arise in more complex environments (we'll discuss these in detail in the next section). The problems, by themselves, are indeed mostly solvable — the actual problem is that solving them requires using (and learning) many additional tools. During the past two years, a myriad of tools have been released that are trying to improve the workflows around SDL-first development: from editor plugins, to CLIs to language libraries. The overhead in learning, managing, and integrating all these tools slows developers down, and makes it difficult to keep up with the GraphQL ecosystem. With SDL-first, the schema definition must match the exact structure of the resolver implementation. This means developers need to ensure that the schema definition is in sync with the resolvers at all times! While this is already a challenge even for small schemas, it becomes practically impossible as schemas grow to hundreds or thousands of lines (for reference, the GitHub GraphQL schema has more than 10k lines). Tools/Solution: There are a few tools that help keeping schema definition and resolvers in sync. For example, through code generation with libraries like graphqlgen or graphql-code-generator. Don't think this is an issue? Take our quiz from the graphqlgen article. When writing large GraphQL schemas, you typically don't want all of your GraphQL type definitions to reside in the same file. Instead, you want to split them up into smaller parts (e.g. according to features or products). Tools/Solution: Tools like graphql-import or the more recent graphql-modules library help with this. graphql-import uses a custom import syntax written as SDL comments. graphql-modules is a toolset to help with schema separation, resolver composition, and the implementation of a scalable structure for GraphQL servers. Another question is how to reuse SDL definitions. A common example for this issue are Relay-style connections. While providing a powerful approach to implement pagination, they require a lot of boilerplate and repeated code. There's currently no tooling that helps with this issue. Developers can write custom tools to reduce the need for repeating code, but the problem lacks a generic solution at the moment. The GraphQL schema is based on a strong type system which can be a tremendous benefit during development because it allows for static analysis of your code. Unfortunately, SDL is typically represented as plain strings in your programs, meaning the tooling doesn't recognize any structure inside of it. The question then becomes how to leverage the GraphQL types in your editor workflows to benefit from features like auto-completion and build-time error checks for your SDL code. Tools/Solution: The graphql-tag library exposes the gql function that turns a GraphQL string into an AST and therefore enables static analysis and the features following from that. Aside from that, there are various editor plugins, such as the GraphQL or Apollo GraphQL plugins for VS Code. The idea of modularizing schemas also leads to another question: How to compose a number of existing (and distributed) schemas into a single schema. Tools/Solution: The most popular approach for schema composition has been schema stitching which is also part of the aforementioned graphql-tools library. To have more control over how exactly the schema is composed, you can also use schema delegation (which is a subset of schema stitching) directly. After having explored the problem areas and various tools developed to solve them, it seems like that SDL-first development could work eventually – but also that it requires developers to learn and use a myriad of additional tools. 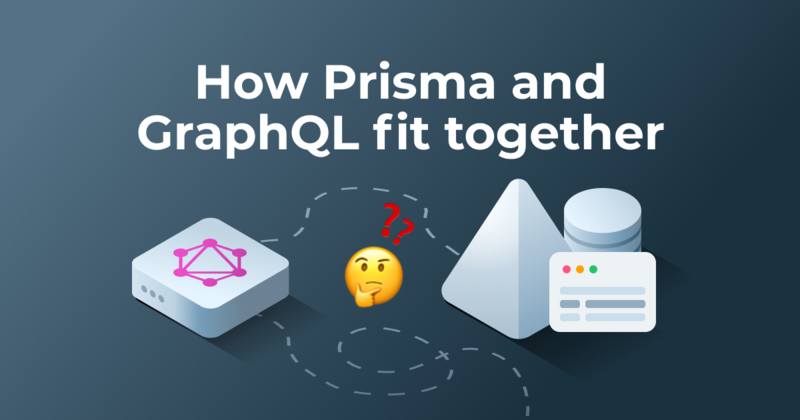 At Prisma, we played a major role in pushing the GraphQL ecosystem forward. Many of the mentioned tools have been built by our engineers and community members. After several months of development and close interactions with the GraphQL community, we've come to realize that we're only fixing symptoms. It's like fighting a Hydra – solving one problem leads to several new ones. We really appreciate the work of our friends at Apollo who constantly work on improving the development workflows around SDL-first development. Another popular example for building GraphQL servers in a SDL-first way is AWS AppSync. It diverges a bit from the Apollo model since resolvers are (typically) not implemented programmatically but auto-generated from the schema definition. 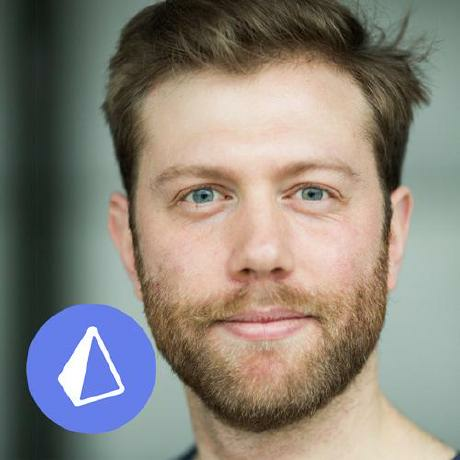 While the community greatly benefits from so many tools, there's a risk of ecosystem lock-in for developers when they need to take a full bet on the toolchain of a certain organization. The real solution probably would be to bake many of the SDL-first opinions into the GraphQL core itself – which is unlikely to happen in the foreseeable future. Another problematic aspect of SDL-first is that it disregards the individual features of a programming language by imposing similar principles, no matter which programming language is used. Code-first approaches work really well in other languages: the Scala library sangria-graphql leverages Scala's powerful type system to elegantly build GraphQL schemas, graphlq-ruby uses many of the awesome DSL features of the Ruby language. Most of the SDL-first problems come from the fact that we need to map the manually written SDL schema to a programming language. This mapping is what causes the need for additional tools. If we follow the SDL-first path, the required tools will need to be reinvented for every language ecosystem, and look differently for each one as well. Instead of increasing the complexity of GraphQL server development with more tools, we should strive for a simpler development model. Ideally one, that lets developers leverage the programming language they're already using – this is the idea of code-first. Remember the initial example of defining a schema in graphql-js? This is the essence of what code-first means. There is no manually maintained version of your schema definition, instead the SDL is generated from the code that implements the schema. While the API of graphql-js is very verbose, there are many popular frameworks in other languages that work based on the code-first approach, such as the already mentioned graphlq-ruby sangria-graphql, as well as graphene for Python or absinthe-graphql for Elixir. A typical editor workflow includes a development server running in the background that regenerates typings whenever files are saved. Once all GraphQL types are defined, they're passed into a function to create a GraphQLSchema instance which can be used in your GraphQL server. By specifying the ouputs, you can define where the generated SDL and typings should be located. The next parts of this article series will discuss code-first development in more detail. Earlier we enumerated the benefits of SDL-first development. In fact, there's no need to compromise on most of them when using the code-first approach. The most important benefit of using the GraphQL schema as a crucial communication tool for frontend and backend teams remains. Looking at the GitHub GraphQL API as an example: GitHub uses Ruby and a code-first approach to implement their API. The SDL schema definition is generated based on the code that implements the API. However, the schema definition is still checked into version control. This makes it incredibly easy to track changes to the API during the development process and improves the communication between various teams. Other benefits like API documentation or empowering frontend developers don't get lost with code-first approaches either. What do you think of this article? 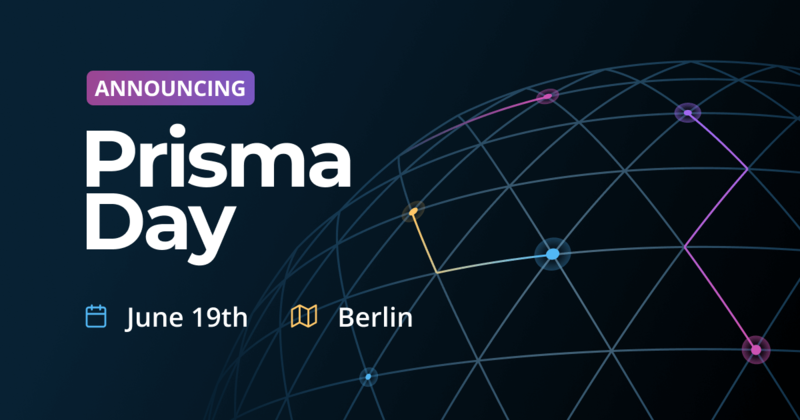 Join the Prisma Slack to discusst SDL-first and code-first development with fellow GraphQL enthusiasts. 🙏 A huge thank you to Sashko and the Apollo team for their feedback on the article!